1) Kalteng Consultants, Kirchstockacher Weg, 85635 Hoehenkirchen near Munich, Germany. The province of Central Kalimantan contains about three million hectares of peatland, which is one of the largest unbroken tropical peatland areas in the world. 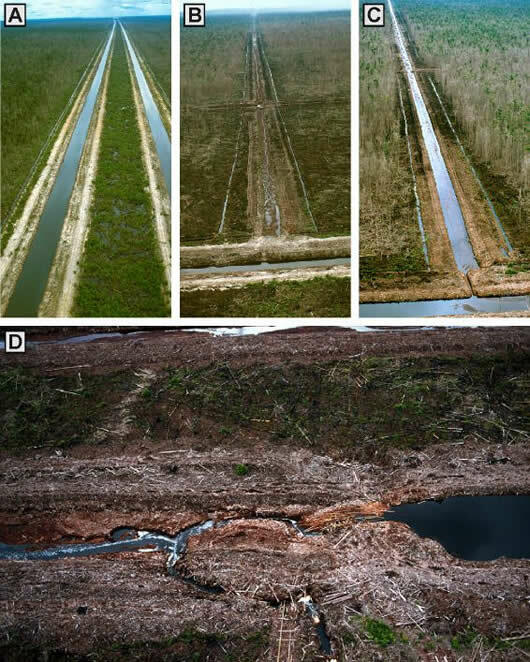 Peat swamp forest (PSF) is among the earth's most endangered and least known ecosystem (12). They have a huge carbon storage capacity and are extremely fragile and liable to disturbance (10). Local communities have used them extensively for centuries with no significant effect on the environment. This changed in 1996 when a programme of massive peatland conversion, the so-called Mega Rice Project (MRP), was initiated with the aim of converting one million hectares of peatland into rice fields. Between January 1996 and July 1998 more than 4000km of drainage and irrigation channels were constructed in the area designated for the MRP (9). Many people were able to access the previously inaccessible interior of this peatland landscape to exploit the residual timber resources, mostly doing this on illegal logging basis and using fire in the process. In August 1997 deforestation was initiated by means of fire clearance as the most economical method. Boosted by the El Niño Southern Oscillation (ENSO) episode in 1997, many of these fires set for land clearing spread into pristine forest areas where they continued to burn with greater intensity. The newly established drainage system aggravated fire impact, fostering this disaster. During five months of drought, the peat layer lost most of its water and the peat itself was ignited. A huge cloud of yellow, noxious smog covered 15 million km² of Southeast Asia for several weeks. After removal of the commercial timber, the remaining tree debris was removed by means of fire as the cheapest, most readily available land clearance method. Using optical and microwave satellite images and ground surveys, it was found that more than 20% of the PSF of the province was destroyed by fire in 1997. Since peat hydrology was disturbed by the drainage system, and the forest biomass was only partly combusted, the risk of fire is expected to be extremely high in the near future. The multi-temporal analysis of six LANDSAT TM image acquired between 1991, 1997 (before the fires) and 2000 shows the quick changement of the sensitive peatland and high rates of deforestation. Two TM images, 118-61 and 118-62, with 5.4 million ha were compared. Additionally the MRP area between the Rivers Sebangau in the West, River Kahayan, River Kapuas and River Barito in the East and the Java Sea in the South was processed and the relative pristine PSF between catchment Sebangau and river Katingan with 2.4 million ha. The total area of MRP impact is 1.5 million hectares for the Blocks A, B, C, D and E. It was found that from the 6 descripted regions with 2.406.732ha in 6/1991 1.560.377ha (64.8%) was covered with forest while in 5/1997 1.377.442ha (57.5%); res. 7/2000 1.110.151ha (45.7%) was covered with forest. Strong logging and illegal-logging took please. Legal logging operation prepared the ground for further degradation of the forests by fire, illegal logging and farming. More than 11,000km of logging railways were mapped in an area of 25,000km². Illegal logging could be often discriminated from legal logging operation in Landsat ETM images by its specific spatial pattern. The logged over area increased by 44% between 1997 and 2000. Field and aerial surveys showed that most of this increase could be attributed to illegal logging. If the situation continues as for the years 1991 to 2000 there is a very high risk that most of the PSF resource in Central Kalimantan will be destroyed within few years with grave consequences for the hydrology, local climate, biodiversity and livelihood of the local people. Unless land use policies are changed to control logging and the drainage of the peatland will be stopped recurrent fires will lead to an irrecoverable loss of this unique rainforest ecosystem.